sadhbh o neill » About me. Beauty and joy are at the heart of my work. They are the emotions that inspire me to create. My sculptures call to me from my intuition, often from a dream, almost as if I have no say in their manifestation. My sculptures are a juxtaposition of contrasting media, textures, patterns and colours. 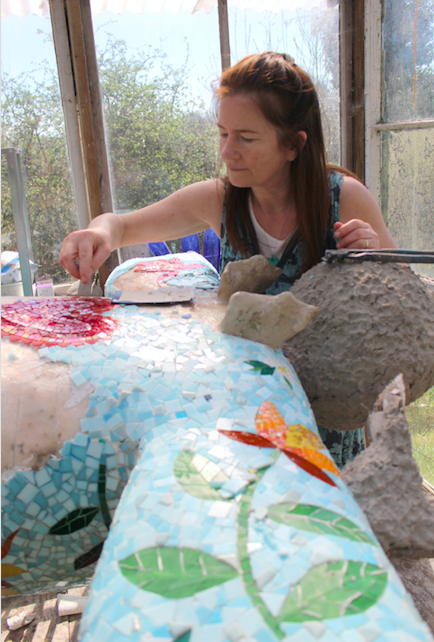 My mosaic work takes time and is meditative and slow – each tile is chosen, cut and then placed, creating patterns of depth and richness. I live in the peace and stillness of the Irish landscape and my studio is my sanctuary. Its where I become grounded, connected and go deep within myself. My goal is to inspire those who see my work to look more carefully at the world around them, to pause, smile and rest in beauty. WALK IN BEAUTY. Navajo Blessing. In the house of long life, there I wander. In the house of happiness, there I wander. In old age traveling, with it I wander. On the beautiful trail I am, with it I wander. In Beauty, it is finished.